If you are in the market for a Florida-style home offering privacy and convenience, please consider 4254 La Rosa Avenue. 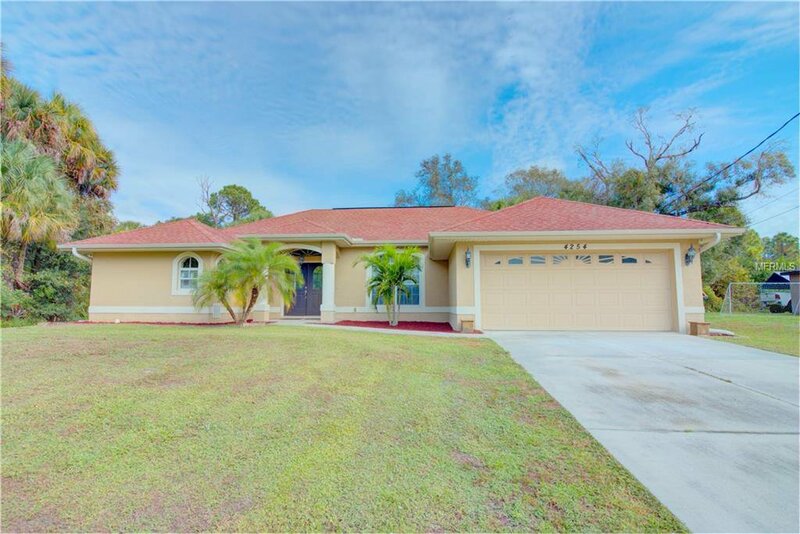 Located in a quiet, peaceful neighborhood on an oversized wooded lot close to I-75, this 2006 built 3 bedroom / 2 bath open concept property might just be what you are looking for. At just under 2000 square feet, this split plan home delivers with well-designed living space. At the center of the home, a roomy kitchen features solid cabinets with wooden doors and ample storage, tons of counter and prep space, an aquarium window overlooking the backyard with room for a breakfast table, newer appliances and a closet pantry with plenty of available shelving. The Master suite offers a tray ceiling with fan, walk-in closets, sliding doors to the screened lanai, a spacious bath with dual sinks, a jetted-soaking tub and walk-in shower. In addition, there are two separate living areas, a dining room, an inside laundry room, two guest bedrooms separated by a well-appointed bath, with high ceilings and fans throughout. Make your appointment to see this lovely home today. Listing courtesy of MICHAEL SAUNDERS & COMPANY. Selling Office: ROSA LEON REALTY LLC.